The Eleventh Zurmang Gharwang was born in Riwochi, into the prominent family of Samdong Chang. His father was Samdong Trukpa, a minister of the region; whilst his mother Yeshe Tsuldron was known to be an accomplished practitioner. The identification of the Eleventh Gharwang tulku was revealed by the Sixteenth Gyalwa Karmapa when he was barely eight years old. 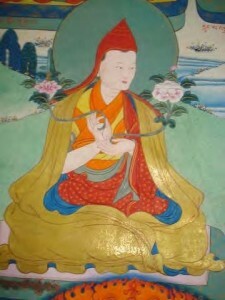 The Eleventh Zurmang Tengah Tulku approached the young Karmapa who until then, was playing merrily outdoors, and asked for indications about the birth of the new Gharwang tulku. His Holiness stopped playing momentarily, and drew a detailed map on the ground leading to the successful discovery of the young Gharwang tulku. The main practice of the Eleventh Gharwang were the Four-Armed Manjushri, as well as the Protector Yamantaka. He was a close disciple of the Second Jamgon Kongtrul Rinpoche, and officiated at the funeral rites of the latter. Throughout the years of 1956 and 1957, the Eleventh Gharwang felt instinctively that dramatic changes would soon take place in Tibetan society, he taught relentlessly, and gave empowerments widely in order to benefit the people. As the situation deteriorated, he entrusted to his mother a Zambala statue which was said to be part of the exquisite Terton treasure made exclusively by celestial hands. He instructed her in the devotional practice of Zambala, and pledged that the blessings of the deity would remain with her and keep her safe. Later, as he felt he could no longer fulfil his aspiration, he considered it more favorable to leave his body and be reborn at a more auspicious time. The statue meanwhile, was carefully preserved by a faithful servant of his late mother, and miraculously returned to the present Gharwang Rinpoche during his first tour to Zurmang in the summer of 1991.